I just love accidental artwork. The kind of things that weren't originally intended to be art but 'discovered' and displayed as art anyway. We have had this piece for about 6 years now, we always get lots of comments on it. You definitely can't miss it in our house - it's pretty huge and so heavy we have always just displayed it sitting on the floor or on a sideboard leaning against the wall. To me it looks like a really intentional and planned piece of artwork but I love that it actually started off life as something pretty mundane and practical. The Mr and I bought this when he joined me on a work trip to Paris. Although I was working most days we had some time together just wandering the streets, getting lost frequently but stumbling across so many lovely little shops and courtyards. We found this little place somewhere in the back streets of St Germain. it was definitely a junky kind of junk shop not carefully selected pieces at all. But in that ramshakle French way it looked so perfect - junk piled high to the roof, spilling out of cane baskets and wooden cabinets. Wheelbarrows full of jars, piles and piles of linen. The shop was full to the brim and stock spilled out into the footpath and even the street! Of course we had to go in - and we found amongst other things, this set of old number stencils. We have some of the smaller sets already but what I loved about these is that they were so huge and that they had been used and had a really cool patina. We even managed to bargain the price down with the little old shopkeeper in my broken French - which was a bit of a woohoo moment in itself! So back home we mounted the numbers on a piece of MDF and voila instant artwork. 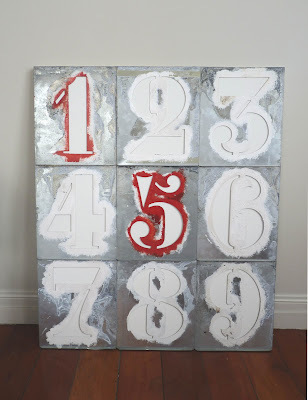 I love the patina of the metal and the way most of the numbers are white but just a couple are red - perfect. Now this is my kind of souvenir. It reminds me of Paris everytime I look at it and I love thinking of the amazing doors around that city and how maybe my stencils painted some of those house numbers long ago.